This tutorial teaches you how to develop Voice Extensible Markup Language (VoiceXML) based applications. VoiceXML is markup language that brings Web-based applications and content delivery to interactive voice response applications; input is in the form of audio (voice or DTMF keypad tones), as is output (text to speech voice or recorded audio files). This tutorial provides an introduction to basic VoiceXML development. It describes the tools you'll need to build VoiceXML-based applications, outlines some basic VoiceXML syntax, and concludes with a few sample programs. The tutorial is based on the version 2.0 specifications of VoiceXML. The course is intented for developers and technical managers who want to get an overview and understandin of VoiceXML application development. To build and test VoiceXML applications, you'll need a ready to go Asterisk/VXI installation. VoiceXML is a standard based on XML that allows Web applications and content to be accessed by a phone. 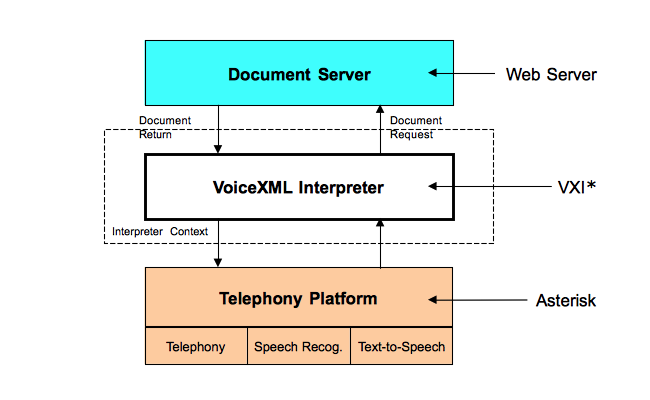 You can develop speech-based telephony applications using VoiceXML. The standard was developed by the VoiceXML Forum, which was founded by AT&T, IBM, Lucent, and Motorola. This figure illustrates the components of the VoiceXML architecture model. The components include the following: * Document server: Processes requests received from the VoiceXML Interpreter and responds with VoiceXML documents. * VoiceXML Interpreter: Interprets the VoiceXML documents it receives from the document server. * Implementation platform: Controlled by the VoiceXML Interpreter context and VoiceXML Interpreter, the implementation platform generates events in response to user actions (for example, spoken or character input received) and system events (for example, timer expiration). The VoiceXML Interpreter context and VoiceXML Interpreter then handles the events. VoiceXML relies on the network infrastucture to deliver and implement applications. Just like HTML is delivered to a Web browser, VoiceXML uses a voice browser for audio input and output. You use a regular phone to access a VoiceXML-based application. The voice browser runs on a voice gateway, which is connected to the public switched telephone network (PSTN, using Voip or ) and to the network as illustrated in the figure. Voice portals: Just like Web portals, voice portals can be used to provide personalized services to access information like stock quotes, weather, restaurant listings, news, etc. Location-based services: You can receive targeted information specific to the location you are dialing from. Applications use the telephone number you are dialing from. Voice alerts (such as for advertising): VoiceXML can be used to send targeted alerts to a user. The user would sign up to receive special alerts informing him of upcoming events. Commerce: VoiceXML can be used to implement applications that allow users to purchase over the phone. Because voice gives you less information than graphics, specific products that don't need a lot of description (such as tickets CDs, office supplies, etc) work well. CTI: VoiceXML can identify and qualify a user before transfering it to a queue. Depending on the CTI integration method, the VoiceXML can push a context to the agent form associated to the user's interactions. Auto Attendent: VoiceXML can replace an operator to redirect calls. It can use the Automoatic Speech Recognition to recognize a user's name from a contact list and transfer the call to the associated extension. The VoiceXML application structure model is a Finite State Machine. A user of a VoiceXML application is always in one conversational state or dialog at a given time. Each dialog is followed by another dialog, and if no dialog is specified next, then the execution of the VoiceXML application is terminated. There are two types of dialogs: forms and menus. Forms collect user inputs in the form of values, just like an HTML form. Menus present the user with a list of options to select from. An application is a collection of VoiceXML documents. All the documents in an application can share the same application root document. Root documents can be used to pass variables from one VoiceXML document to another. Any variables defined in the root document are available for all your documents. A grammar specifies a list of permissible vocabulary for the user to select from in order to interact with the VoiceXML application. Each dialog has one or more speech and/or grammars associated with it. An event is thrown by the VoiceXML platform for a number of reasons, such as when a user does not respond to an input, doesn't respond correctly, requests help, etc. The VoiceXML interpreter also throws events in case there are any semantic errors in the VoiceXML document. Because VoiceXML is an extension of XML, you will have to follow the basic rules for XML, which include: * Well-formed XML documents: All elements must have a closing tag. * A root element: All documents must have a root element. The root element for a VoiceXML document is vxml. * Attributes: Attribute values must always be quoted. * Nesting: All elements must be properly nested. The form and block elements are discussed in the next section. In this example, the name of the form is “hello” and “Hello world” is presented to the user. <subdialog>: like a function call, invokes a call to another dialog on the current page or another VoiceXML document. A form item variable is associated with each form. The form item 'variable by default' is set to 'undefined' initially and contains a result (collected from the user) once a form item has been intepreted. You can define the name of a form item variable by using the name attribute. A guard condition exists for each form item. The guard condition tests whether the item's variable currently has a value. If a value exists, then the form item is skipped. dtmf: If choices in a menu don't have explicit DTMF elements, they are given implicit ones “1”, “2”, etc. This is only if DTMF is set to 'true'. The choice element specifies the URL to go to based on the choice selected from the menu. The enumerate element specifies a template that is applied to each choice in the order they appear in the menu. So, for the above example, the menu's prompt would be, “Say what sports news you are interested in: hockey; baseball; football”. The link is activated when you say “red” or press “1”. The next attribute of the link element specifies the appropriate destination. An event is thrown by the VoiceXML platform for any number of reasons, such as a user not responding to an input, not responding correctly, requesting help, etc. An event is also thrown if there is a semantic error in the VoiceXML document, or when the <throw> element is encountered. The <throw> element generates an event (user-defined or system) and the <catch> element catches the event thrown by the VoiceXML document, dialog, or form item. In this case, an event is generated when an input by the user is not recognized as part of the active grammar. The attribute for the <throw> element is event, which defines the event to be thrown. In this VoiceXML example, you will be creating an application that gives you a selection to choose from. Once you make a selection, you are taken to the appropriate document or dialog. In this section, you will create the main greeting message of the application. In the code below, the user hears a “welcome” message and is then given a list of choices from the main menu. The <goto> element is used to skip to the menu section. In this section you will create the menu for the VoiceXML application. The menu gives you four selections to choose from. DTMF is enabled, which allows for key presses by setting the dtmf attribute to 'true' in the <menu> element. The menu is created using the <choice> element and the next attribute specifies what document or anchor to go to. An event is caught, using the <catch> element, in case the user doesn't respond, says “help”, or the input by the user is not recognized. The user is prompted with a question – if the user does not say anything, or if there is no match with the active grammar, the user is asked the survey question again. If the user asks for help, the user hears the help information and is asked the question again. After successfully responding to the survey question, the code within the <filled> element is executed and the user hears a confirmation message and is returned to the main menu. Please say what you think of your instructor. You can say excellent, good, fair, or poor. good, three for fair, and four for poor.